The Soyuz TMA-21 mission (No. 231, ISS mission 26S) in April 2011 had a goal of delivering three members of the International Space Station crew, which represented the 27th and 28th long-duration expeditions onboard the orbiting outpost. 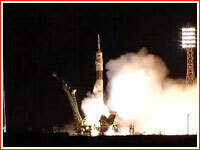 On the eve of the 50th anniversary of human space flight, Russia sent a fresh crew to the International Space Station. The Soyuz FG rocket carrying the Soyuz TMA-21 spacecraft with a crew of three lifted off from Site 1 in Baikonur Cosmodrome on April 5, 2011, at 02:18:20 Moscow Summer Time. The vehicle departed from the same facility, which hosted the historic launch of Yuri Gagarin and the blastoff of the world's first artificial satellite. After a nine-minute powered flight, Soyuz TMA-21 entered orbit safely, mission control reported. The Russian space agency, Roskosmos, officially dedicated the Soyuz TMA-21 launch to the pioneering mission of the Vostok spacecraft on April 12, 1961. 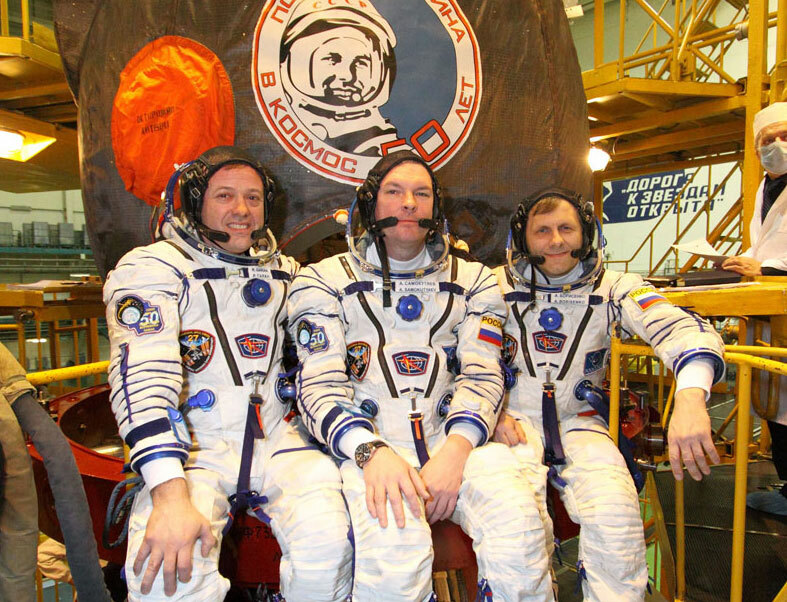 Onboard the station, the crew of Soyuz TMA-21 will join three other members of Expedition 27, who arrived onboard the Soyuz TMA-20 spacecraft in December 2010. As of October 2009, the launch of the Soyuz TMA-21 spacecraft was planned for March 30, 2011, however technical problems discovered during pre-flight processing in Baikonur in the first half of March 2011 required a delay. The problem, affecting the Kvant-V command radio system, was eventually traced to a faulty component. Engineers made the decision to replace the affected avionics unit, requiring several days of additional testing. By March 17, 2011, a new launch date was set for April 5, 2011. On March 31, 2011, Soyuz-TMA-21 was transported from the processing facility at Site 254 in Baikonur to the launch vehicle assembly building at Site 112 for integration with the Soyuz FG rocket. 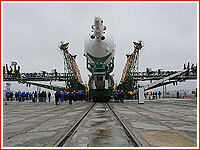 On April 2, 2011, the launch vehicle with the spacecraft was roll out to the launch pad at Site 1. The docking of the Soyuz TMA-21 spacecraft with the MIM-2 Poisk module of the International Space Station took place on April 7, 2011, at 03:09:17 Moscow Time. At the time, the spacecraft and its crew were expected to remain at the outpost until September 2011. Flight Engineers Sergei Volkov and Alexander Samokutyaev closed the hatch to the Pirs docking compartment ending their spacewalk on August 4, 2011, at 01:13 Moscow Time (EDT: August 3, 5:13 p.m.) The duo were wearing Russian Orlan spacesuits and worked outside the Russian segment of the International Space Station. Volkov and Samokutyaev worked for six hours and 23 minutes performing a variety of tasks for both science and maintenance. Outside the Zvezda service module the spacewalkers installed laser communications equipment. The laser-based system will test the transmission of up to 100 megabytes per second of Russian science data to the ground. Also, an antenna with signs of degraded performance was photographed to assist engineers on the ground searching for a solution to the problem. The Radioskaf-V, a small satellite containing an amateur radio transmitter and a student experiment, was deployed after ground controllers took time to work on an antenna problem. Operating now at about 50 percent capability, the satellite was originally planned for deployment at the beginning of the spacewalk. 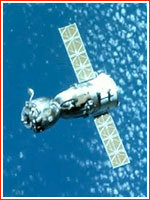 The primary task of the excursion, the relocation of the STRELA-1 cargo boom from the Pirs to the Poisk module, was called off due to time constraints. The cosmonauts would have used another boom, the STRELA-2, to move the hand-operated crane to aid future spacewalkers. Both telescoping booms extend like fishing rods and are used to move massive components outside the station. An antenna that helped guide the Poisk mini-research module to a docking in November 2009 has been removed and was returned to the station at the end of the spacewalk. That task had been postponed earlier in the spacewalk due to difficulties with the Radioskaf-V and cable connections. The BIORISK experiment was successfully installed on a handrail outside Pirs. The materials science experiment studies the effect of microbes on spacecraft structures and whether solar activity affects microbial growth. 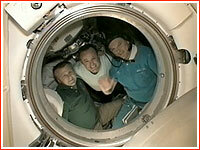 Finally, they took more photographs outside the Russian segment before entering Pirs, closing the hatch and completing the spacewalk. 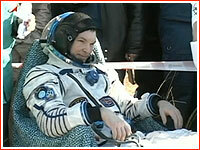 This was Samokutyaev’s first spacewalk. Volkov completed two spacewalks while he was commander of Expedition 17 in July 2008. On Sept. 15, 2011, around 4:30 p.m. Houston Time, a hatch between Soyuz TMA-21 and the MIM-2 Poisk module was closed in preparation for the undocking of the transport ship from the International Space Station. Onboard the Soyuz were Andrey Borisenko, Ron J. Garan and Aleksander Samokutyaev, members of the 28th long duration expedition who spent 164 days in space. The opening of the hooks between two vehicles took place around 7:35 p.m. Houston Time followed by the actual undocking three minutes later (04:38 Moscow Time, 00:38 GMT on Sept. 16), as the spacecraft were flying over Northern China. Soyuz TMA-21 then initiated a 4-minute, 14-second deorbiting maneuver at 10:05 p.m. Houston Time on September 15. The engine firing reduced the velocity of the spacecraft by 115 meters per second enabling it to drop of its orbit and initiate the reentry into the Earth atmosphere. The separation of the spacecraft's compartments was scheduled to take place around 10:33 p.m. Houston Time on Sept. 15, some 28 minutes after the beginning of the braking engine firing, as Soyuz had been flying 87 miles above the Earth surface. However no communications had been received, until a beacon from the Soyuz was picked up at around 10:43 Houston Time, indicating separation, according to NASA. No voice signal from the crew was received at the time, despite repeated requests by mission control. Only at 10:48 Houston Time, a message from an Antonov search and rescue aircraft confirmed good two-way communications with the Soyuz crew. Soyuz TMA-21 touched down in Kazakhstan on Sept. 16, 2011, at 07:59:39 Moscow Time (approximately 11:00 p.m. Houston Time on Sept. 16), just five seconds off scheduled time, some 149 kilometers southeast of the city of Dzhezkazgan, about three hours after local sunrise. Eight Mi-8 helicopters were on hand to provide search and rescue support. Several other aircraft were also deployed around the touchdown area in case of the ballistic return. Around 11:05 Houston Time rescue teams reported that they found Soyuz TMA-21 on its side, as the first helicopter landed near the craft two minutes after the spacecraft's touchdown. At around 11:13 Houston Time, first video from the landing site showed the routine process of the crew extraction from the capsule.